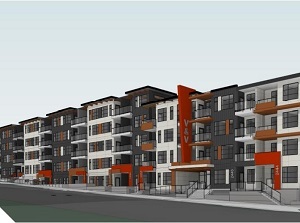 ICM Group, an international asset management firm, has partnered with Alberta-based PK Developments and Providence Group to build a 135-unit apartment complex in Marda Loop, one of Calgary’s inner-city neighbourhoods. John Courtliff, ICM’s managing director, said Alberta’s economy is recovering and the company intends to pursue further opportunities to acquire or invest in what it considers to be quality real estate assets in the province. “Over the next 18 months, we’ll be looking for opportunities. Where we’ve been sitting on the sidelines to date, we’re very active in pursuing value-added and opportunistic transactions, particularly (in) Alberta but throughout Western Canada,” he said. Construction on the Marda Loop project began in November 2017. It is on a one-acre development site along the busy 33rd Avenue S.W. main road through the neighbourhood. Six bungalows were accumulated over the course of five or six years for the site. “Initially it was consolidated by Providence for the purposes of a condo project,” Courtliff said. “But after oil prices (dropped) off in 2014 and 2015 and condo absorption slowed, Providence reevaluated the project before eventually joining forces with PK in 2016 to repurpose the project to a purpose-built apartment building. The four-storey building is expected to have first units available by early 2019. It will have one- and two-bedroom units. Building amenities will include a workout facility, a theatre and entertainment room, a rooftop patio and bike storage. He said the decision to proceed on this project as an apartment rental building, as opposed to condo units for sale, is the right decision. “Home sales had softened materially as a result of the downturn in oil prices and it wasn’t really expected that new home sales would recover quickly. While they have recovered somewhat, I think that would still be a difficult condo project,” said Courtliff. “It is on 33rd Avenue so you’re either north facing on the alley or south facing onto 33rd Avenue. So from a buyer perspective, those are both challenging prospects. Courtliff said ICM owns or manages eight properties in Calgary which include industrial, office, retail and multi-residential use. “We’re opportunistically looking for additional property but the economics need to make sense for us,” he said. “With today’s sort of challenging environment, that’s been a bit of a tall task. But we’re optimistic that we’ll be buyers in 2018 with additional property in Calgary. ICM Group, founded in 2003, is a fully integrated alternative asset investment firm. It has about $650 million in assets under management. From its offices in Calgary, Atlanta, Delray Beach, Minneapolis, Mexico City and Munich, ICM’s core objective, it says, is to provide institutional, high net worth and retail investor clients with strong risk-adjusted returns through direct investments in opportunities outside of stocks and bonds.